Point Spread Definition - What Does Point Spread Mean? What does the term "point spread" mean in the world of betting? What is the definition of the term "point spread"? When two teams meet, you will usually have a "favourite" (the team that is favoured to win the game) and an "underdog" (the team that is not supposed to win). 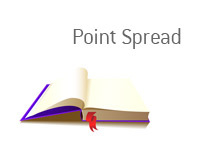 The purpose of a "point spread" is to even things out, so to speak. By utilizing a point spread, we are giving one team extra points in order to make the odds for both sides even. For instance - let's say that the Denver Broncos are playing the San Diego Chargers at home in NFL action. The Denver Broncos are supposed to win this game - as a matter of fact, they are 4/1 favourites to win. By utilizing a "point spread", the oddsmakers give the San Diego Chargers points in order to even the betting odds. In this case, a successful $350 wager on the Broncos would yield a total profit of $100, while a successful $100 bet on the Chargers would yield a total return of $275. So, if you wanted to take the Broncos in this case, you would need to give up 10.5 points. If you would be willing to do that, a successful $110 wager would yield a total profit of $100. If the Broncos ended up winning 17-10 and you took the Broncos minus the 10.5 points, you would lose your bet. On the other hand, if you wanted to take the Chargers, you would receive 10.5 points. So, if the Broncos ended up winning 30-20 and you took the Chargers plus the 10.5 points, you would end up winning your wager.